This is the first industry newsletter that I actually rush to my email on Sunday to check for. I have so much junk mail that never informs me of anything, but the Tao has seriously ignited my already burning crave to be a colorist. A weekly newsletter about the craft and business of Digital Color Grading. Delivered for your Sunday morning coffee. Sign Up Now, Stay Informed! for professional Video / Film Colorists & Finishers. Delivered Sundays. For months, NAB was creeping up on us. Then BAM!, it's gone. After 5 days (including Sunday's Colorist Mixer) I'm feeling a little punch-drunk. In the coming weeks I'll have more to say (and share) about this year's events and new releases. Today, it's taking the last of my energy reserves to get this Newsletter out! But do you know where that energy is coming from? This week, not from our Sponsors - it comes from you, my readers! Thank you, all the Tao Newsletter readers who said 'Hi' to me this week at NAB! At the Colorist Mixer, at the Mixing Light Presentation Theater, on the Exhibition Floor, and even on the monorail. It's a thrill meeting you, in person - even if we only had a few moments to chat. And hearing your stories of HOW you read this Newsletter is great fun (my favorite this year: At Church!). This 400th edition of the Tao Colorist Newsletter is officially dedicated to all of you! Today's Newsletter is mostly a collection of product announcements (and links to posts with even more product announcements). It takes a week (or month) for pundits to gather their thoughts and offer analysis and insights. But take a scan and see if you missed anything. I'm sure there's an item (or three) you want to click through to! I am ready to rest comfortably for the remainder of this weekend. This is your Tao Colorist Publisher signing off to say: See you next Sunday! Featuring the work of creative craftsmen, the theory of color, and industry news. Learn practical workflows, useful theories, and actionable insights from existing (and emerging) leaders and teachers in our industry. (video) A quick overview of what's coming up in ACES 1.2 - and a review of the purpose of ACES. At a 'Birds of a Feather' discussion, this article summarizes the state of various initiatives by the ACES team. We've spent the last 3 years designing a shared storage device for color, editorial and VFX workflows. We call it the Jellyfish. With an integrated database server, it's perfect for Resolve's groundbreaking Collaborative Workflow. It can now be purchased on apple.com. 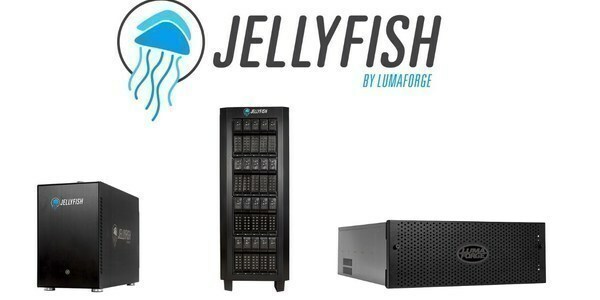 Jellyfish Shared Storage Systems start at under $10,000. Our craft keeps changing. And growing. Learn about updates to your favorite software. Discover new tools to help you work faster or more creatively. Build your toolchest with new techniques and approaches. (video) I had trouble linking to an article that neatly lists all the headline features in Resolve 16 better than Blackmagic's product page. So that's what I'm linking to... This includes a 25-minute video walk through of the new features. Get a permanent discount on a monthly subscription to the Mystica Boutique color grading and finishing platform. I got a demo at NAB. Color me impressed (and I saw only a fraction of what it can do). A nice overview of new features in Flame. I do miss their presence on the show floor. Friend of the Tao, Scott Simmons, takes you to the Avid Connect press conference and shares his contemporaneous thoughts about the new announcements. He also embeds several useful videos that shows the new features in actions. Personally, I'm happy to see the updated UI. A good roundup of the latest news from many of the players in the post production space. (video) Scroll down for the 1:45 video showing how this share and review app integrates media, comments, annotations, and uploads in Resolve 16. This sale ends April 19 for these already affordable software scopes. This new plugin from FilmConvert is designed to match cameras based on their sensor profiles (without using LUTs). This script uses command line integration to, "Let Projector create your projects with repeatable bin structure, standard nomenclature, and standard media assets." Nifty. A good wrap up of which cameras and software platforms are supporting ProRes RAW. Is it having trouble gaining traction? 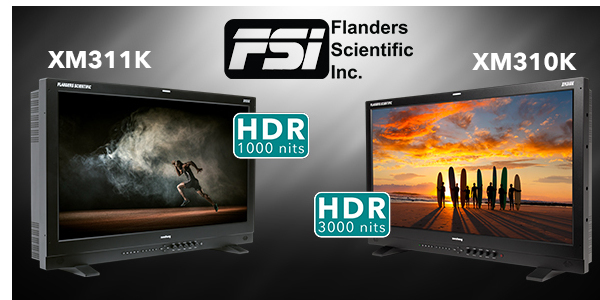 The 1,000nit XM311K and 3,000nit XM310K both qualify as Dolby Vision mastering monitors. The XM311K features innovative Light Modulating Cell Layer technology and now has a lower list price of $35,000. Do you require a brighter display? Then the XM310K is one of the brightest commercially available professional HDR monitors on the market. These stories are from MixingLight.com's membership Library. It's a color grading website (Tao Of Color is co-Owner). Do you want to read a story listed here but not a member? Sign up for a free 7-Day Test Drive.​​​ There's also a free Resolve Course and color correction Practice Projects. The Team discusses a new training title we produced for Dolby about creating Dolby Vision content. Plus, Our thoughts about the upcoming NAB 2019. Stay updated on the latest hardware that's shipping - because the craft of color grading isn't just about software. Plus, keep an eye on future equipment trends and camera odds-and-ends. A terrific round-up post of NAB-related news for the production crowd. From cameras to lenses to lights and more. This new keyboard speaks to the online linear editor in me. But at $1K? I'll need to get my hands on it to see if it gives me much more than a KB Cover. As Dolby Vision evolves, older consoles and newer TVs may have compatibility problems. This article is a little harsh in that regard - but I think they have a point about Dolby Vision needing to start differentiating with version numbers if they expect this to keep happening. An amazing display that was demo'ed at NAB. In a theater, if someone were to open their phone you wouldn't notice. But I was too busy being wow'ed by this theatrical-sized video display to decide if it feels 'cinematic'. New workstations designed for 8K post-production workflows. For my geeky readers out there. "ATSC 3.0 promises better, more robust reception, with error correction . . .supports 4K Ultra-HD and better sound, mobile viewing on smartphones and other devices," Get the details. Random thoughts, tidbits, and fun stuff that caught my attention this week. Maybe it's color grading related. Maybe not. Ya got'ta read to the end of the Newsletter to find out. Click though and scroll down because this just looks cool! (video) This trailer has lots of lovers. And lots of haters. Me? I'm a shrugger. This saga started when I was 11. And now, at 53, I know exactly where I want this last episode to end. I'll be pleasantly surprised if it ends like it should. But I'm prepared if they take it somewhere else. Either way, episodes IV and V solidified my love for Sci Fi in all mediums - whatever happens in IX, they can't take that away. Th- th- th- that's all folks! See you next week!